The Property of Mr J Baxter of Threlkeld, having been awarded the £60 Premium, will cover Fell Pony Mares at 15/- each, with 2/6 Groom's Fee, due at time of service. 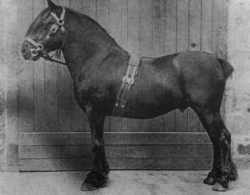 "Mountain Ranger" is black, foaled 1906, and stands 13.3 high. His sire is "Park End King" and his dam is "Scoredale Queen" by "Blooming Heather" (325). He will travel with the Board of Agriculture Certificate of Soundness, which is open to inspection. Mr Baxter will not be answerable for any loss or damage through the trying or serving of mares, but every care will be taken. All Mares tried by this horse and served by another, or sold, exchanged, or given away will be charged full price. Total minimum distance for the week: 88 miles. Joe Baxter would be walking beside the stallion, with his coat strapped to the surcingle together with a "bait-bag" containing oats and the day's food for himself, and maybe a few "bare necessities" in the coat pockets for the night's stopover. Compare Mountain Ranger with a modern stallion: Waverhead Prince II.